Following three years during which only 32mn mt/yr of new liquefaction capacity was sanctioned, 2019 is expected to be a record year. Clearly, there will be winners and losers. In fact, it is likely that we will see over-investment that could lead to a supply glut emerging in the early 2020s. It would not be the first time this has happened in the LNG business. The mood is a stark contrast to the three years that followed the oil price crash of 2014. As the reality of “lower for longer” oil prices – and therefore gas prices – began to sink in, capital budgets were slashed and final investment decisions began to dry up. LNG liquefaction projects were particularly hard hit, not just because funds were short and capital costs had escalated but also because of perceptions that a supply glut was looming. The four years between 2011 and 2014, when oil prices stayed north of $100/barrel for almost all the time, had seen new waves of capacity sanctioned in Australia and the US. That capacity is still coming on stream today. But only two liquefaction projects were sanctioned during 2016, totalling 6.3mn mt/yr; one during 2017 for 3.4mn mt/yr, and four during 2018. When Shell and partners announced FID on the 14mn mt/yr LNG Canada project last October, it was the first green-field onshore liquefaction project to be sanctioned in over three years. Excluding that project, only 17.6mn mt/yr of capacity was sanctioned during 2016-18. The stampede has already begun. Qatar Petroleum and ExxonMobil announced in early February that they had reached FID on their proposed Golden Pass project at Sabine Pass in the US state of Texas. At the same time they signed an engineering, procurement and construction (EPC) contract with a consortium of Chiyoda, McDermott and Zachry. Expected to cost “$10+ billion”, the three-train project will have capacity of 15.6mn mt/yr. On its own that is more than half the total liquefaction capacity sanctioned during 2016-2018. The partners are not following the LNG industry’s traditional model of projects selling most of their capacity to end-buyers – to underpin project finance – before reaching FID. In this sense they are following in the footsteps of LNG Canada, where Shell and partners have decided to each lift their equity share of the output. Moreover, it appears that the LNG Canada partners are not seeking non-recourse project finance, and Golden Pass also looks as though it will go ahead without project finance. So far, Golden Pass is the only project to have formally announced FID in 2019, but two other projects that appear to be very close are Venture Global’s Calcasieu Pass in the US and Novatek’s Arctic LNG 2 in Russia. Venture Global was waiting for two approvals before proceeding with Calcasieu Pass: authorisation from the Federal Energy Regulatory Commission (Ferc) to site and construct the plant; and authorisation from the Department of Energy (DOE) to export LNG to countries with which the US does not have a trade agreement (non-FTA countries). The FERC authorisation was granted in February and the DOE approval in early March. The project has executed binding 20-year offtake agreements with Shell, BP, Edison, Galp, Repsol and PGNiG totalling 8mn mt/yr, and has raised $855 million of capital. However, it remains unclear how the company intends to finance the remainder of the project’s cost. The project will have capacity of 10mn mt/yr, so formal FID would take the total amount of capacity sanctioned in 2019 to 25.6mn mt/yr. The Russian oil and gas company Novatek has impressed the entire LNG industry by bringing the Yamal LNG project in Arctic Russia on steam a year ahead of schedule, despite the challenges posed by the harsh environment. It is now working on Arctic LNG 2 and CFO Mark Gyetvay says the company has already contracted “more than 50% of the equipment” for the project. Novatek has also closed an agreement under which Total will take a direct 10% interest in the project and lift 10% of its output. Novatek intends to retain a 60% interest in the project and so now needs only to agree partners for the remaining 30% and has received plenty of interest. Partners will be expected to lift LNG proportionally to their equity stake. Gyetvay says that Novatek has already made its own decision to proceed with the project and that it will only require to debt finance 30% of the total cost. The three-train project will have capacity of 19.8mn mt/yr, so a formal FID would take the total amount of capacity sanctioned in 2019 to 45.4mn mt/yr. Arguably the most credible of the projects hoping to take FID in 2019 is the expansion of capacity planned in Qatar, which would take its capacity from just over 77mn mt/yr today to close to 110mn mt/yr by 2023. The expansion will consist of four 7.8mn mt/yr “mega-trains”, similar to the six already operating at Ras Laffan. Saad Sherida Al-Kaabi, energy minister and CEO of Qatar Petroleum, has said he expects FID before the end of 2019, but this will depend on how much progress Qatar makes in the negotiations under way to select partners. The clear favourites are the companies that are already the major foreign partners in the nation’s LNG industry: ExxonMobil, Total, Shell and ConocoPhillips. No announcements have been made about offtake contracts but it is likely that partners will be expected to lift LNG according to their shares in the project. It is possible that FID may slip into 2020, given the complexity of the negotiations, but if it is taken before the end of this year it would add another 31.2mn mt/yr to our running total for 2019, taking it to 76.6mn mt/yr. For so much capacity to be sanctioned in a single year would be unprecedented for the LNG industry. * Among the most credible of the remaining contenders are the two expansion trains in the US: the fourth train at Freeport LNG (5.1mn mt/yr) and the sixth train at Cheniere Energy’s Sabine Pass (4.5mn mt/yr). Both projects have an impressive track record of successful development, with Sabine Pass being the first of the first wave of projects in the Lower 48 states. * The remaining contenders in the “second wave” of US export projects are all hoping to reach FID during 2019 but will need to overcome significant remaining hurdles if they are to do so. Tellurian has attracted a lot of attention to its Driftwood LNG project, not least because the company is headed by “LNG celebrities” Charif Souki, Martin Houston and Meg Gentle. But it still needs to sell a good chunk of its output if it is to attract the necessary finance to proceed with FID. Much the same applies to NextDecade’s Rio Grande project. * Sub-Saharan Africa will be another focus of attention during 2019, with three projects aiming to each FID, two in Mozambique and another in Nigeria. Together they would add 36.1mn mt/yr to the total. The Anadarko-led Mozambique LNG project is following the traditional model of selling most of its output to third-party buyers under long-term contracts and has recently exceeded the target it had set itself for the proportion of its output it wanted to secure in this way. The Rovuma project led by ExxonMobil and Eni is following the model of requiring the project partners to lift their equity shares of output. Nigeria LNG, meanwhile, is determined to proceed with its 8mn mt/yr expansion and is spending serious money on two parallel front-end engineering design processes, but has faced delays in the past and could do so again. * That leaves the two projects in Canada, Woodfibre and Goldboro, and the proposed third train expansion at Russia’s Sakhalin 2. While all three have a credible chance of proceeding eventually, it would not be surprising to see them slip into next year or beyond. Once 2019 has come to an end, it will be fascinating to look back to see which of all these projects went ahead with FID, and how much over-investment there actually was. The International Energy Agency, in its latest five-year gas market forecast, projected that world LNG demand would grow to 371mn mt in 2023. This is only around 50mn mt more than in 2018. Even allowing for the fact that some of the capacity operating today will have closed by then, this would not leave much room for new plant, especially considering the amount of new capacity still in the construction phase. But volume will not be the only criterion worth examining. Project models are clearly shifting, with a clear trend towards project partners lifting LNG according to their equity shares and therefore assuming the market risk. 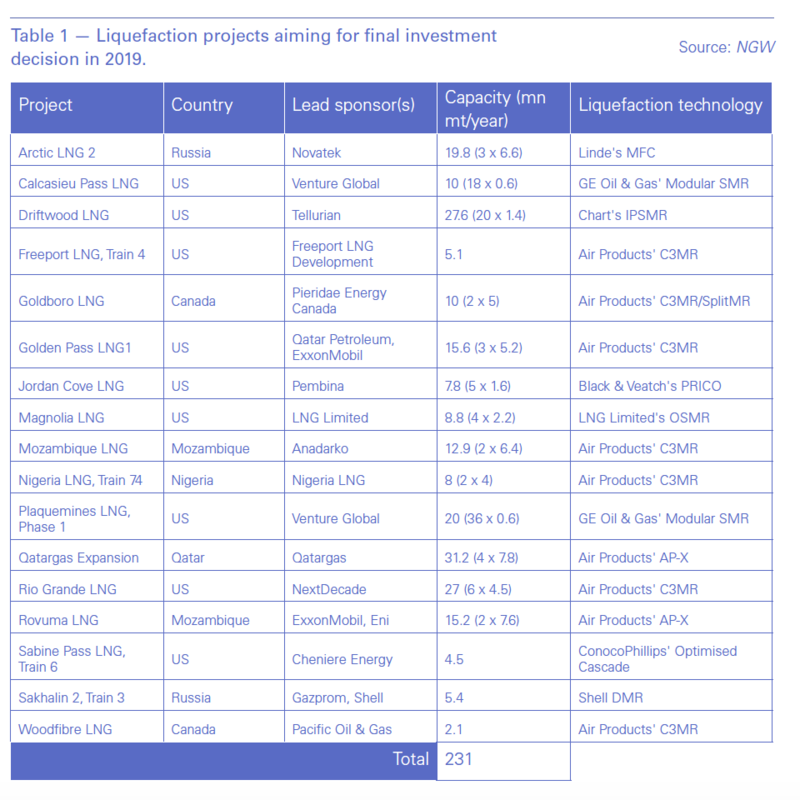 A less obvious shift is a possible move towards new liquefaction technologies, as the table clearly shows. The traditional Air Products propane-pre-cooled mixed refrigerant (C3MR) and the ConocoPhillips Optimised Cascade processes are facing more competition than ever. So the 2019 stampede may not just lead to a record year for liquefaction FIDs. It could in several other ways be a pivotal year for the entire industry.